And what kind of things might such kids write? 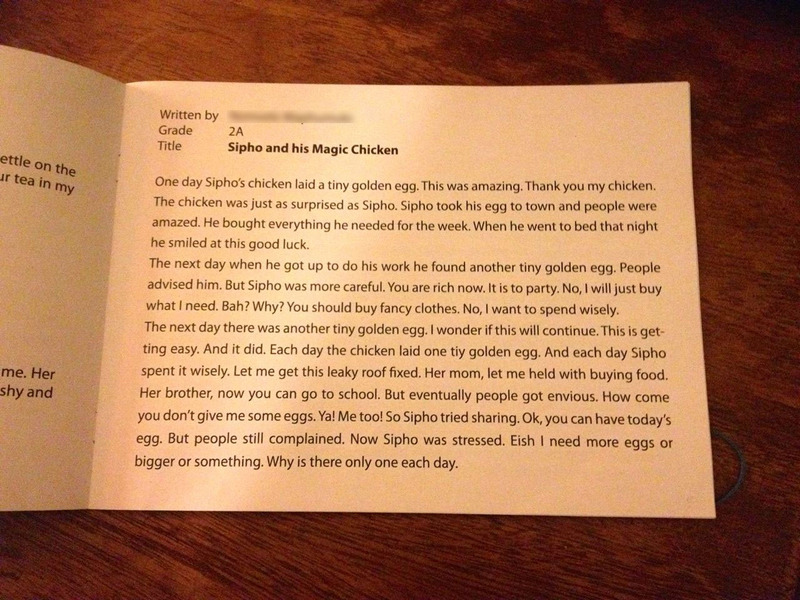 Well look at that – a story about a boy named Sipho and his magic chicken! It seems that the kid didn’t always get the order of the panels correct, and they only included content from the first four pages, but it’s kinda cool to have been used in such a way. I have to say, looking through the book with what I know of early grade school kids in SA, a lot of it must be plagiarized. 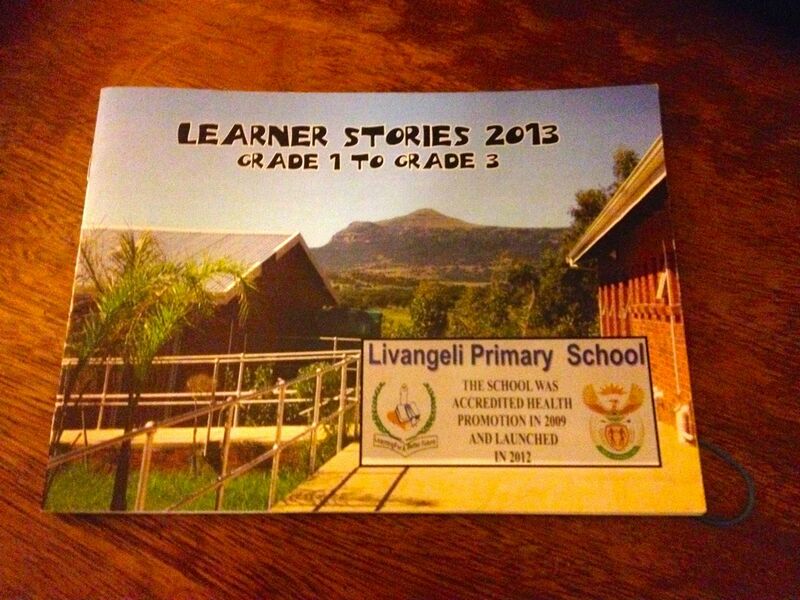 I would not expect many kids at that age to be able to write stories in English. I wouldn’t blame the kids – they’re often asked to complete impossible tasks and rewarded only if they cheat their way through them. There’s often a profound disconnect between the kids’ abilities and resources and what they are asked to do. There are a lot of kids performing processes that make no sense: copy pages out of a textbook into your notebook, letter-by-letter if you have to. Later you’ll be “tested” on the topic, which is just a bunch of words you have no concept of. You’ll be judged harshly if you fail to perform. I am reminded of a teacher at Thalana this year that demanded his students turn in their papers typed and printed. When the kids originally told me this, I thought they must be pulling my leg. But no, the teacher confirmed this requirement when I spoke with him. I explained that the kids didn’t have ready access to computers, and he insisted that they should be able to use the library. I reminded him that the library has only four computers and there are thousands of students in town competing for them, not to mention a steady stream of people just wanting to watch youtube and play with facebook. He grudgingly allowed the students to turn in their flawlessly handwritten paper… this time. For some kids in some schools, the whole thing must seem like some Kafkaesque nightmare. Luckily that’s not the case for all schools. Still, there’s something flattering about my little book getting far enough to be plagiarized by a kid I don’t know for a compilation book I had nothing to do with. Next year we’ll see if I can work my way up to being plagiarized by high schoolers. Not sure if previous comment went through? Hi Moira! You know, now that I reflect I am not 100% sure about that – when it was shown to me I thought that’s what I was told, but perhaps I am remembering wrong or was otherwise misinformed. In the interest of accuracy, I’ve removed that attribution. It may have been another organization. It’s worth noting that whoever published the book shouldn’t be blamed either – there’s no practical way they could know what was happening. I was planning on running a writing contest myself for the second edition of the comic book, and it occurs to me now that I’d have no way to vet the submissions either!